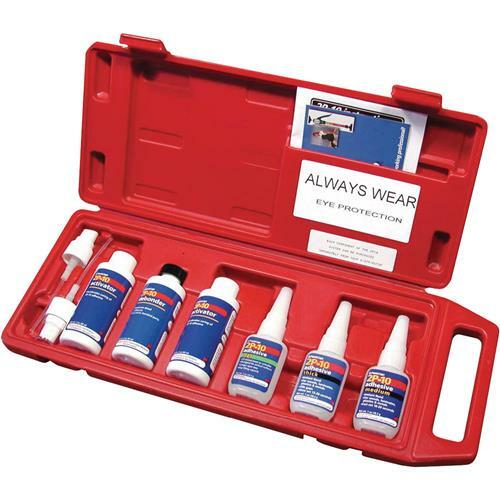 Due to restrictions on certain paints and industrial coatings, this item cannot ship to the following states: California, Colorado, Connecticut, Minnesota, Oregon, Rhode Island, and Vermont. 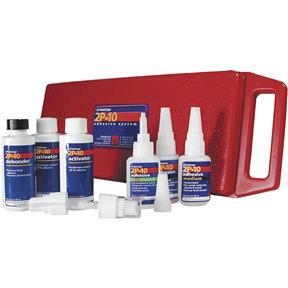 With 2P-10 you can easily glue the hardest joints in cabinetry without clamping! Jel: Will not run, all purpose application, excellent for vertical surfaces. Thick: For use on porous surfaces such as particle board. Medium: For use on smooth surfaces such as melamine and laminate, excellent crack wicking properties. Thin: Excellent micro crack filling and precision mending, zero glue line. Kit includes: 1 - 2+ oz. jel, 1 - 2+ oz. thick, 1 - 2+ oz. medium, 1 - 2+ oz. thin, 1 - 2+ oz. activator,1 - 2+ oz. debonder, micro-tips. great product . Have used for many years. works well, fast shipping, good pricing , nice case.